1 of 1 In a medium-size bowl, whisk together vinegar, mayonnaise, honey, salt and pepper. Whisk in olive oil and dill and set aside. 1 of 2 Heat a medium-size pot of lightly salted water to boiling. Add pasta and cook as per package directions, about 8 minutes. Drain and rinse with cool water; let cool until room temperature. 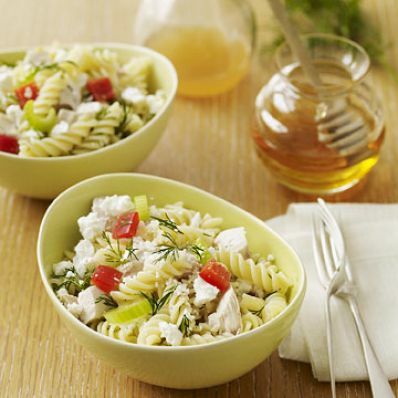 2 of 2 In a large bowl, combine cooled pasta, chicken, red pepper, celery and crumbled feta. Drizzle with dressing and toss to coat. Serve immediately, or refrigerate until ready to serve; toss to blend dressing and ingredients before serving.